Be a Happy Free Spins Leprechaun throughout June! 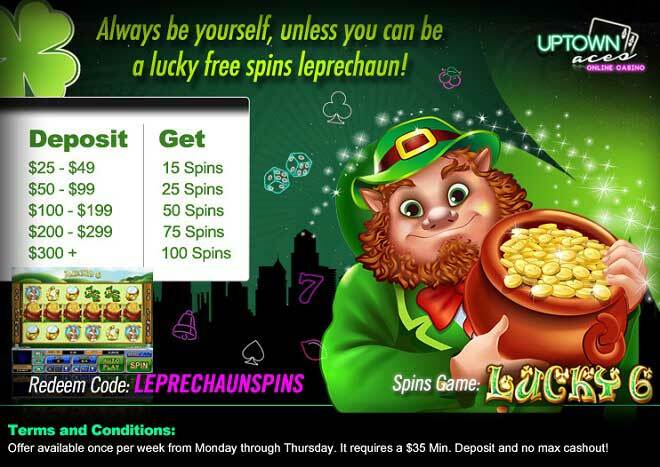 June is the perfect time to be exactly who you want to be - especially if that someone is a dancing leprechaun parading towards up to 100 Free Spins! Deposit as little as $25 and let your inner leprechaun out when you spin the reels of Lucky 6 reels! Your happy winning dance is on when you cash in with the help of Grouped Wilds, Extra Wilds, Wild Reels and all wins multiplied times 5! And the end of each rainbow there’s a pot of gold waiting for you this June - and every weekend there are up to 100 Free Spins waiting to be spun!